1. Alex Gibney is a great documentary filmmaker. "Client 9: The Rise And Fall Of Eliot Spitzer" is a telling documentary about politics, the banks, and how men throw away everything for high price call girls. The film will definitely get you thinking. Today I watched "Taxi To The Dark Side," the film he won the Oscar for. It's a film about the brutality used by American forces towards terrorism suspects since the Iraq war. The more you watch things, or read things or investigate things; the harder it is to have any sense of who the good guys are in the world. Maybe that's always been the case. Remember in school? Nazi Germany was bad and everyone else was good. Now everybody's bad and nobody's good. 2. Mariah Carey has been irrelevant for years. Nobody listens to her music anymore. But in "Precious" she drops the big breasted diva act and does something incredibly human. Amazing. 3. I met Bill Nighy a few weeks back. I was sitting in the front row of the cinema and spotted him two seats away from me. At the end of the film we chatted for a bit. If you think I'm name dropping you should see the way he casually mentioned Judi Dench. 4. I still haven't seen "Black Swan." 5. When was the last time you watched a movie without a physical or psychological problem? Most of the time we're stressed because of our day, or worrying about tomorrow's meeting, or shifting awkwardly because of a back pain, or feeling restless because of hunger. When is it ever perfect? 6. Does your girlfriend/boyfriend understand your creativity and career choices? Can they support it? Do they know when to leave you alone? Or are you single because of these very difficulties? 7. Have you noticed how your favourite TV shows always have the best theme tunes? Its impossible to love a show and hate the music. 9. I won a bloggie award last year and It'd be incredible to win for the second year in a row. The realistic part of me says a blog is just a blog. But the ideological side of me says that this blog represents an idea. It represents and champions stories and independence and passion and pure enjoyment of the cinema. And when something represents those things, it needs support; because the other side are over-represented. They have money, advertising budgets, hundreds of staff; and they advertise brands; and they wipe outanyone with a unique voice. So these little awards and links from people, plus the positive word of mouth -- they really mean everything. You can vote for me in the best entertainment blog category here. 10. And point 9 matters and is worth believing in because things are changing. We're in control now, not the big corporate guys. Nobody knows how the future will play out. They're hoping 3D lasts forever, but it won't. The future is being decided by fifteen year olds with flipcams. We can hold on to old ideas of filmmaking and distribution, or we can reinvent things ourselves. The playing field is getting more even. If your video is genius; three million people on YouTube will see it. if you make a second one that's just as good, another two million will see that. You created them videos. You own them. Some corporate guy will offer you a big cheque to make a commercial or to write a screenplay for the studios. But it's up to you now, not them. You're the kid with the camera. The corporate guy wants money, you want a career. You're in the driving seat. Don't forget that. Nobody knows anything. If you have the talent: keep making stuff until you're so brilliant that they'll be asking YOU how the future will look. Do you have 10 for me? lol! nice reading it..... are these 10 in exact order or did they just come randomly out of here mind!?! I am so lucky that my other half has been cajoling me to be creative for the last 8 years. It is really important I think to have that level of support. There is something about watching films that makes me forget all my troubles. As soon as I sit in front of that screen I forget all my troubles. Great post for the weekend. 1. The Fighter looks worth a watch. 2. True Grit should get a viewing at some point. 3-10: Steer well clear of How Do You Know. Seriously. Am confident it will break all kinds of records at the Razzies. 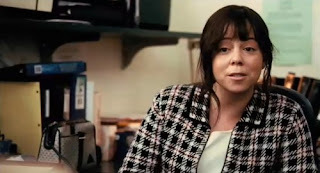 I also liked Mariah in Precious. But overall I hated the movie and found it offensive. It's every single stereotype about urban Black youth packed into a two-hour flick. The acting may be amazing, but the movie was just another step back for non-White America. Haven't seen Black Swan, either. I wonder if it has been over-hyped? Fantastic post, Kid. I haven't seen Black Swan either but then I don't really understand/enjoy films that make me extremely physically uncomfortable when I watch them. I don't want people to think I'm some sort of Pollyanna but I always think that if the film is absolutely miserable and is going to make me absolutely miserable, I'm not sure what the point is. Can't I just watch the news if I want to be miserable?